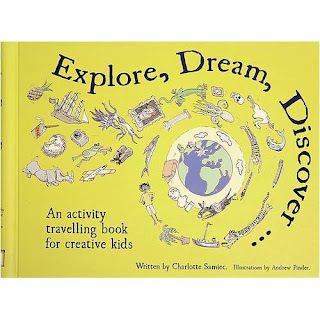 I love this book by Charlotte Samiec! Not just because the colour of the cover is chartreuse, one of my favourite colours. I could write an entire blogpost about that colour, and I will but not now! It's a great book for children of about 8-10 years old. Zoe is 8 and I think she will enjoy it. It features a range of creative stuff (drawing, writing) to do while you're traveling very much based on observations of your new environment. Like 'Write what you did today from your shoes' point of view'. Or a list of stuff children have to spot in an art museum or gallery like 'a loaf of bread, a suitcase and a painting with a really crazy name'. Kids can also record foreign words, traveldata etc etc. There's a mini Snakes and Ladders game in there as well. Too much to mention really. At the back of the book there is a place to store tichets and such. And last but not least: the book is wonderfully illustrated by Andrew Pinder. sounds like a great book for when we go away over the summer to keep miss G entertained! It sounds like a great book. It already found its way to my amazon basket. I'm sure you will like it too!